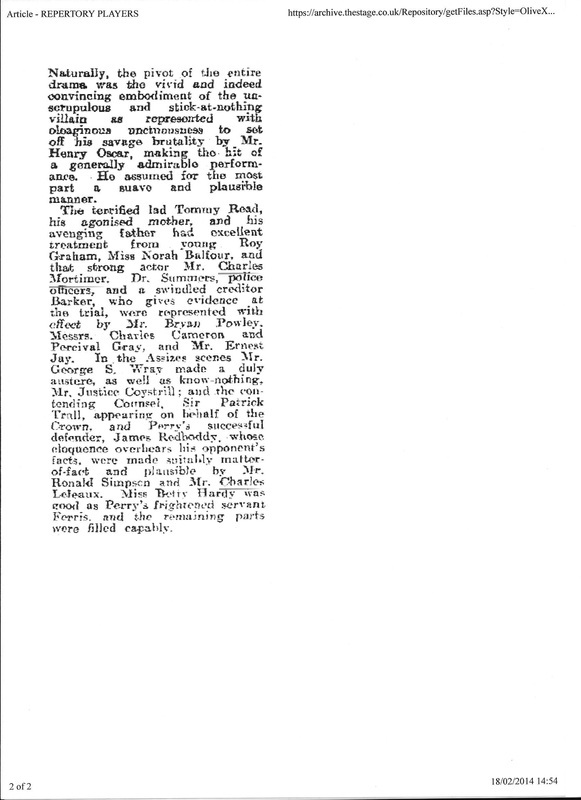 From The Stage - Thursday 02 February 1933. 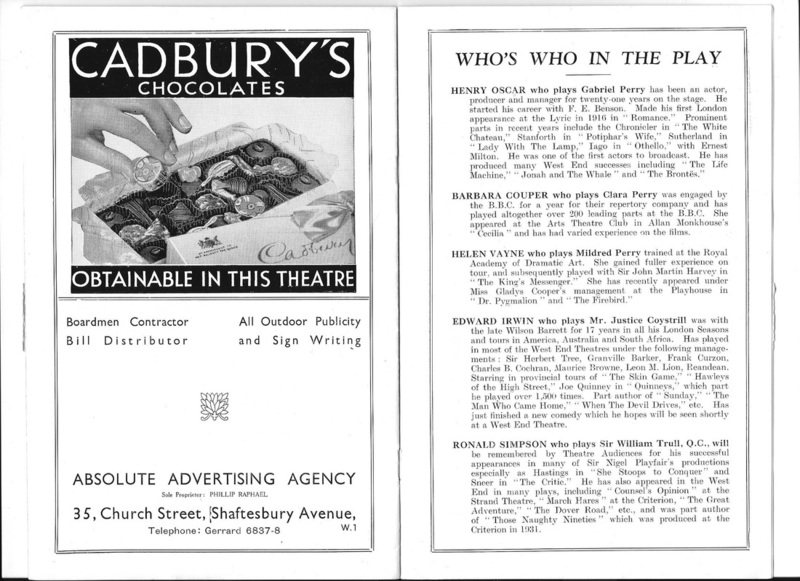 The Stage - 23 February, 1933. Savoy Theatre, London. "The terrified lad Tommy Read, his agonised mother, and his avenging father had excellent treatment from young Roy Graham, Miss Norah Balfour, and that strong actor, Charles Mortimer." 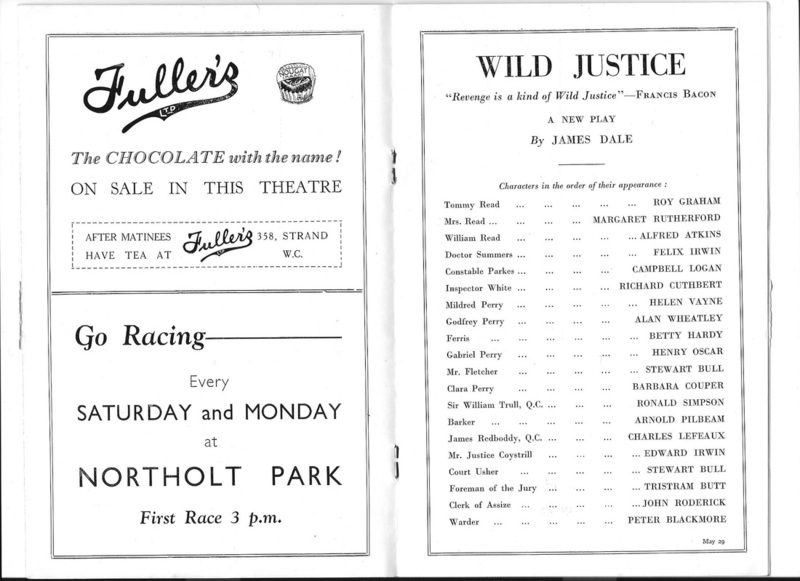 Charles Mortimer played William Read in "Wild Justice", at the Savoy Theatre, London, on 19 February, 1933. The play depicted the tale of a murderer in the 19th century. 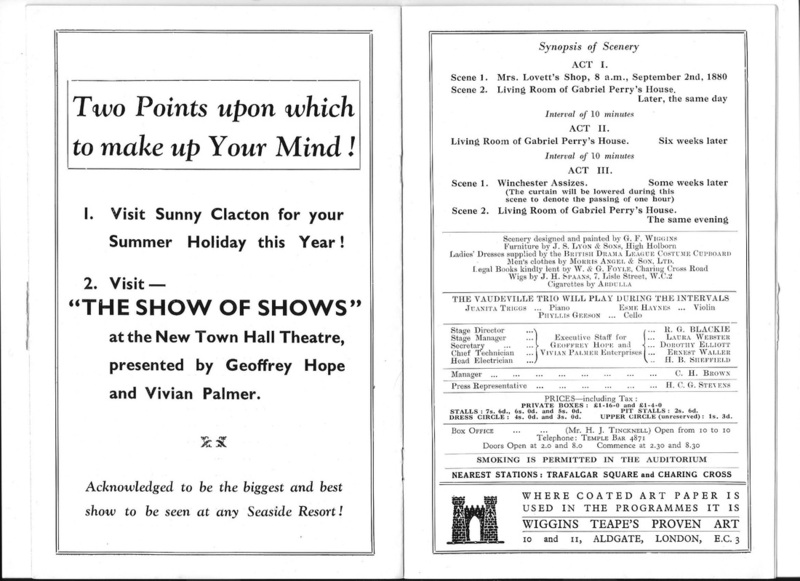 The programme below is from the first production of the play, not including Charles Mortimer. 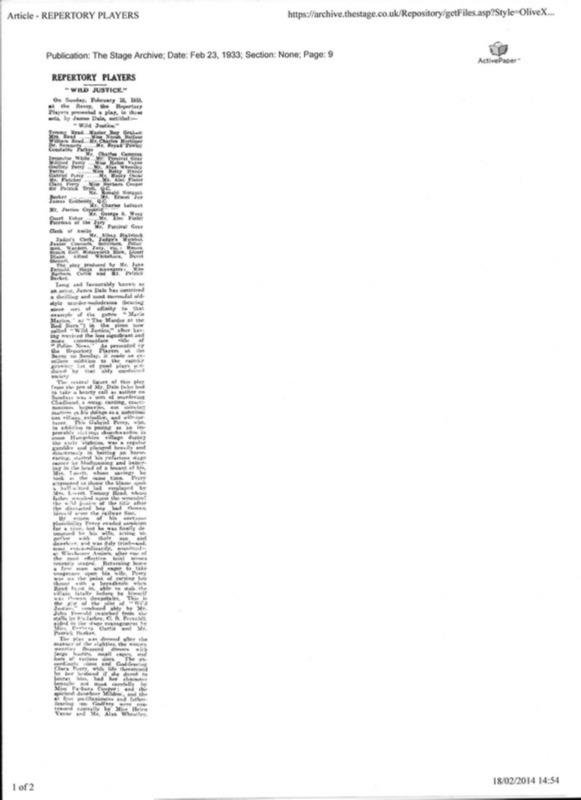 From The Era of 15 February, 1933. 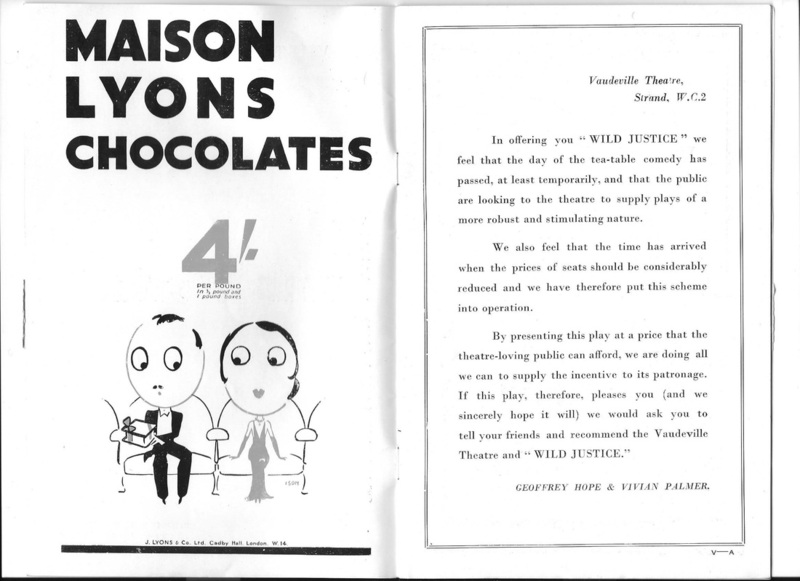 The Repertory Players will present "Wild Justice", a crime play, by James Dale, at the Savoy Theatre Sunday next. 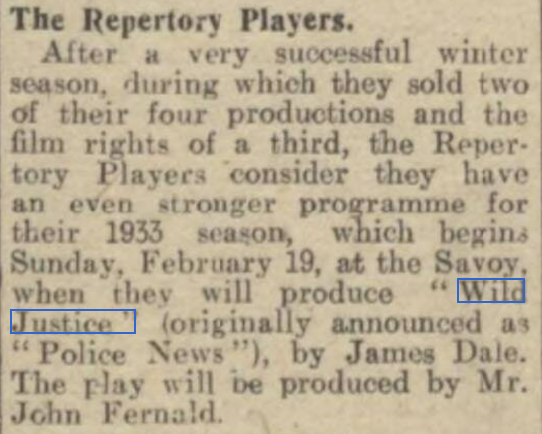 From The Era of 22 February, 1933. 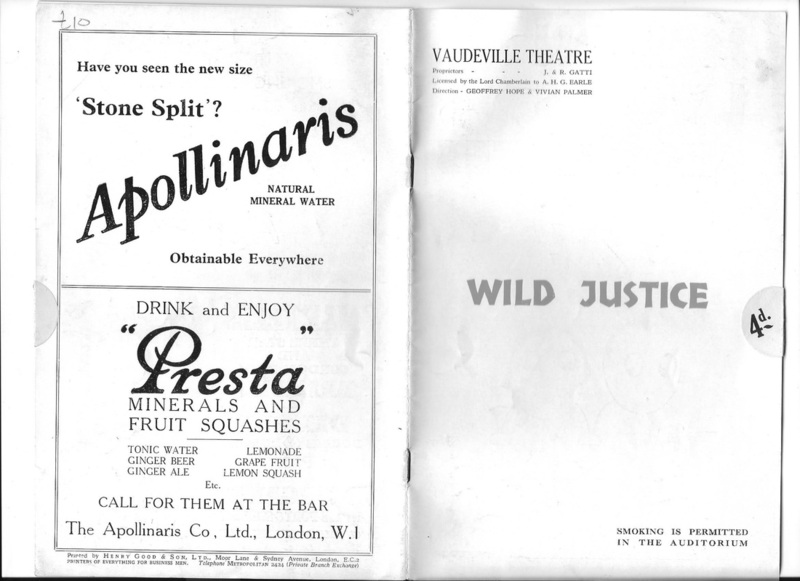 Justice certainly does run wild, and one’s interest is roused to the point of "wanting to interfere ", in this distinctly well-made superthriller, written by James Dale and produced by the Repertory Players at the Savoy on Sunday. Mr. Dale (writes R. B. M.) has a sense of proportion, and because of this his play is most effective. 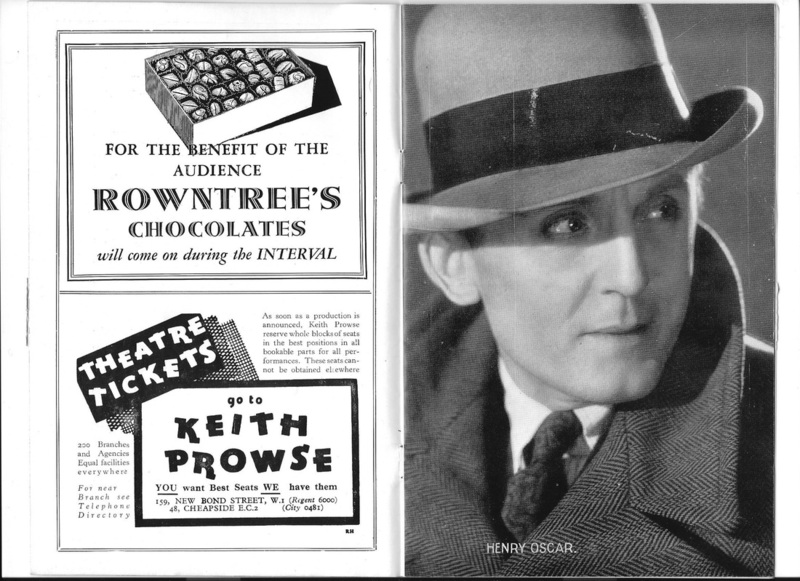 As it is, his terrific villain, Mr. Perry (played with great skill and rare calculation by Henry Oscar), is not at all subtle; in fact, he goes about gloating and revelling that he has murdered Mrs. Lovett (because he was in debt and saw that her money was comparatively easy to get). ​After daring moves on the part of Mrs. Perry (this part was played extremely well by Barbara Cooper, whom, I predict, will one day be a star in the more serious sense of the word). Perry is arrested and brought up at the Assizes. 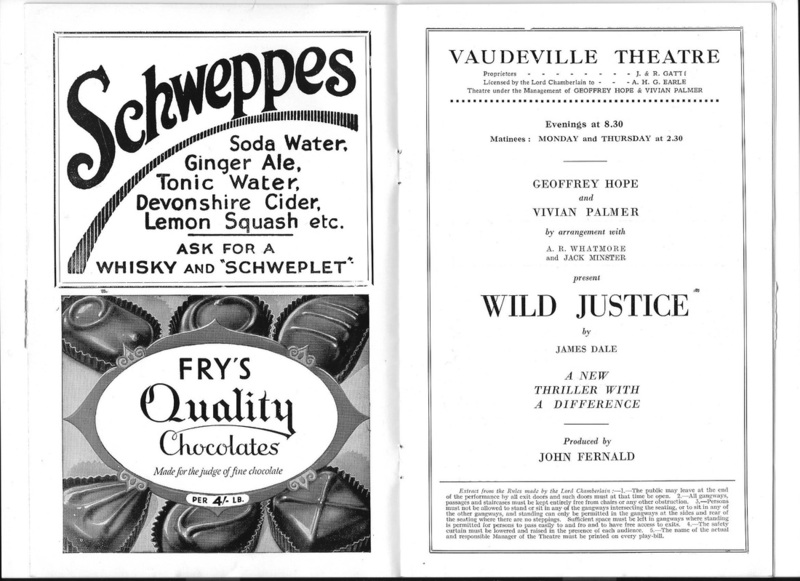 This scene was particularly well produced by John Fernald. Besides those I have mentioned, the cast included Norah Balfour, Charles Mortimer, Bryan Powley, Charles Cameron, Percival Gray, Alan Wheatley, Betty Hardy, Alec Finter, Ronald Simpson, Ernest Jay, Charles Lefeaux. Geo. S. Wray, Roy Graham, and Helen Vayne.